Tuners provide a reference point for you to tune individual strings one at a time. These days, a tuner is pretty much an essential accessory to carry with you wherever you take your banjo. When you play a string, the tuner “hears” the note and gives an indication of the note’s pitch by showing a letter name for the note closest to it in pitch, with an accompanying ♯ (sharp) or ♭ó (flat) sign, if needed (for instance, if the note you’re playing is closest to an F♯ in pitch, the tuner reads F♯). The tuner also indicates whether your string is sharp (too high) or flat (too low) in relation to your reference note via a meter or a row of small LED lights. An electronic clip-on tuner is shown in the figure. 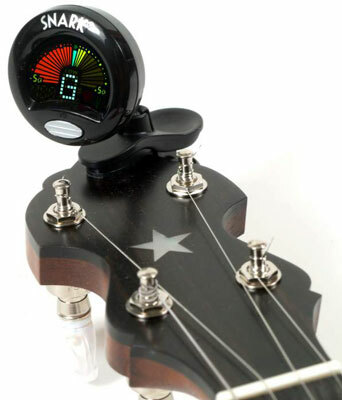 Using an electronic clip-on tuner makes banjo tuning easier. Equivalent notes: You may notice that some notes in the preceding series have an or between them. Without getting too boring, just remember that a G♯ is the same pitch as an A♭ó, an A♯ is the same as a B♭ó, and so on. These equivalent notes are found at the same fret on your fingerboard. Pitch: As you move to the right in the order of notes, you’re naming higher-pitched notes; as you move to the left, the notes are lower pitched. Half versus whole steps: If you move one note in either direction (for instance, going from a C♯ or D♭ó note to a D note), you move a half step. If you move two notes in either direction (for instance, going from an F to a G or from a C to a D), you move a whole step. A half-step movement corresponds to a change of one fret up or down on your banjo fingerboard, and a whole step equals a movement of two frets from one note to the next. For example, if you’re playing an open string and you want to move up a half step, you fret the 1st fret of that same string. If you want to move up a whole step from an open string, you fret the 2nd fret. To use an electronic tuner, you turn the tuning pegs until the readout matches the note that string should match. For example, if you’re trying to tune your 3rd string to a G and the tuner gives you an F♯ reading, you know from the preceding order of notes that your 3rd string is far enough below a G pitch that the tuner hears the note as an F♯ — the pitch that’s one half step below G.
To get your 3rd string in tune, continue striking the 3rd string with the right hand and slowly turn the tuning peg to raise the string’s pitch. At some point, the tuner’s readout should change from an F♯ to a G note, but at this point the tuner tells you that your 3rd string is a flat G note instead of a sharp F♯. Continue raising the pitch of the string until the tuner indicates that the string is exactly in tune to a G note. You use the same process for each of the strings, raising or lowering their pitches until the tuner indicates that you’ve reached the desired note. Don’t strike the strings too hard when using an electronic tuner. A light touch is best for the tuner to give the most reliable reading. Also, the meter on some tuners shifts slightly to the left or right as it responds to ever-so-slight changes in pitch that occur as a string continues to vibrate. If this happens to you, tune the string to the pitch that the indicator “sits on” for the majority of the time that the tuner is registering its pitch. This approximation gets you close enough to do a touch-up on that string by using relative-tuning techniques.